A compact screen cleaner that sticks securely to the back of a phone when not in use. Has a microfibre cleaning surface with a resilient adhesive backing that remains sticky for many uses and can then be washed and reused. It is ideal for cleaning phones, cameras and any other devices with small screens. Size: Screen Cleaner: L 40 mm x W 40 mm x 1 mm. Card: L 89 mm x W 57 mm. 40mm x 40mm plus bleed if required. 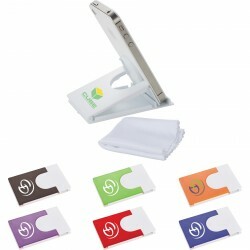 Desktop mobile phone holder with folding stand. Includes removable stylus/screen cleaner combo. Media device not included. 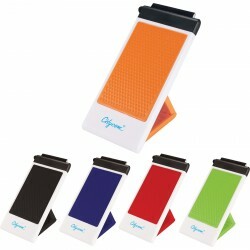 Functions as a media stand with enclosed cleaning cloth. Media device not included. Protective case for iPhone® 6. Media device not included. Protective case for iPhone® 6 Plus. Media device not included. Universal 3.5mm audio splitter allows two people to listen to the same media device at the same time with their own set of earbuds. The keychain keeps the product handy at all times. Mini-stylus is included for touch screen devices. Media device not included. Adjustable arm band. Media Velcro pocket. Earphones and accessories not included. Folding phone caddy converts any power outlet into a hanging-charging station by simply plugging your power cord into the wall. Folds flat for easy storage. Power cord not included. Media device not included. Slimline PVC wallet which attaches to the back of a phone or phone case with strong 3M adhesive that won't leave marks if it is removed. It is ideal for holding a driver's licence, ID, hotel key, credit card or business cards. Waterproof phone pouch which will hold most phones. 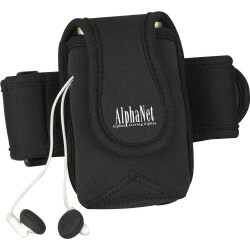 Has an adjustable neck cord and a zip lock and Velcro sealing system. NOTE: A production lead time of 10-15 working days, plus shipping, applies to this product as this item is a product directly sourced from overseas. Very useful phone holder that attaches to car air vents allowing a smart phone to be used for easy hands free navigation. Fully adjustable to 89 mm wide so it will hold almost any phone. NOTE: A production lead time of 10-15 working days, plus shipping, applies to this product as this item is a product directly sourced from overseas. Phone stand with a unique non-slip pad which keeps the phone in place. The unit folds flat for easy storage and is ideal for use at home or office and is also a perfect travel companion. NOTE: A production lead time of 10-15 working days, plus shipping, applies to this product as this item is a product directly sourced from overseas. Fold out phone and tablet stand complete with non-skid rubber ends. Folds flat when not in use so is ideal for mailing or slipping into brochures and information packs. NOTE: A production lead time of 10-15 working days, plus shipping, applies to this product as this item is a product directly sourced from overseas. 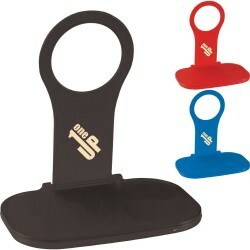 Key ring with a slide out phone stand and swivel out microfibre screen cleaner. NOTE: A production lead time of 10-15 working days, plus shipping, applies to this product as this item is a product directly sourced from overseas. Microfibre screen cleaner which also has a handy brush for sweeping key boards. NOTE: A production lead time of 10-15 working days, plus shipping, applies to this product as this item is a product directly sourced from overseas. 220gsm microfibre cloth (150 mm x 150 mm) for cleaning screens and eyewear which is presented in smart clear plastic sleeve. Branding is on the sleeve. NOTE: A production lead time of 10-15 working days, plus shipping, applies to this product as this item is a product directly sourced from overseas. Telescopic selfie stick which will securely hold almost any smart phone. It extends to 517mm and retracts to a compact 145mm when not in use. Alto has a cable which plugs into the phone audio jack and supports both Android and iOS allowing photos to be taken by pressing the conveniently located button on the handle. 17 ml pump action cleaner for screens, camera lenses and eyewear which features a unique wrap around microfibre cloth. The words Screen Cleaner are printed on the base of the unit for identification. Soft foam filled screen cleaner which can be manufactured in any shape with branding on one side and a soft microfibre screen cleaner on the reverse. Simply send us the artwork and we will create a stunning design. A production lead time of 20 working days applies to this product. Soft foam filled screen cleaner with a powerful light which can be manufactured in any shape. 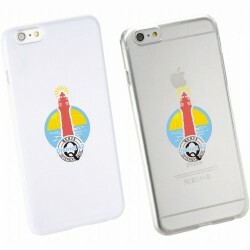 It has branding on one side and a soft microfibre screen cleaner on the reverse. Simply send us the artwork and we will create a stunning design. A production lead time of 20 working days applies to this product. Spring loaded phone holder with a soft PVC clip which pushes onto car air vents and securely holds a phone so it can be seen by the driver and used as a GPS. Soft and stretchy wallet which adheres securely to the back of a phone or phone case with strong 3M adhesive that won't leave marks if it is removed. 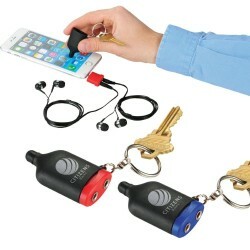 It is ideal for holding a drivers licence, ID, hotel key, credit card, business cards, cash, house or car key and will even stretch to hold a set of ear buds.